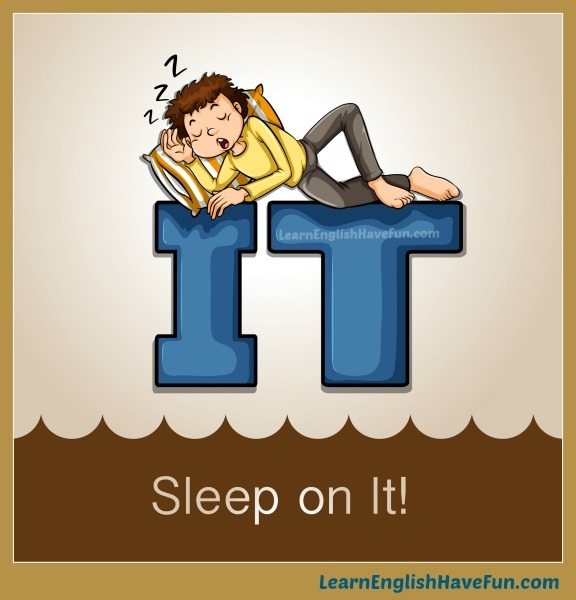 Can you guess the meaning of the idiom 'sleep on it' from looking at the picture? To sleep on something (sleep on it): to wait until the next day (in order to think carefully) before making an important decision. What's "IT" in the picture above? "It" is any decision that you have to make. It's a way of saying that you need more time to think about something and you don't want to make a quick decision that you may regret or feel sorry for making later. Also, being able to sleep not only gives you more time but it gives you a chance to NOT think about the issue for awhile. Sometimes, when you think about things so much you actually feel more confused and stressed out. So, if you can sleep, you are able to relax your mind and get rest. When you wake up the next day you can think about the issue again and make a better decision than if you were rushed. I received two jobs offers today. I asked them both to let me sleep on it so I can review the offers and decide which is best. You seem a bit stressed out and I don't want you to make such a big decision if you're feeling confused or worried. Why don't you sleep on it and we can talk about it again tomorrow? I wanted to sleep on it but my manager said I had to sign the contract by the end of the day. I suggest you sleep on the proposal—maybe even sleep on it a few days. I wish I had slept on the purchase because the next day I found a much nicer dress and I can't return the other one. Of course you can sleep on it but please remember that I can't make any promises it will still be here tomorrow—this is my last sofa in this color. I couldn't decide which law school offer to accept so I decided to sleep on it. The next day I still couldn't decide so I just flipped a coin. My wife wanted to adopt the dog right away but I insisted we sleep on it. We are both happy that we were able to explain to the children that they will be responsible for taking the dogs for walks, even early in the morning. I never buy anything that costs more than $250 without sleeping on it first. If you found this idiom useful, sign-up for my free newsletter to learn when I add new idioms and find out about other updates to my website. This will help you practice your English and remember this idiom in the future. No pain no gain (it's hard to practice but if you don't do it your English will not improve). Do you like to sleep on things before making decisions? Is it difficult for you to ask for permission to sleep on something? When is the last time you decided to sleep on anything? Return from "sleep on it" idiom to the main idioms page.